few know that some of these same men made an epic overland trek that ultimately resulted in one of the US Navy’s greatest victories. By the spring of 1813 the American squadrons building on Lake Ontario and Lake Erie were in desperate need of men. Writing to Secretary of the Navy William Jones on March 5, 1813, Commodore Isaac Chauncey asked for 300 sailors and 200 Marines for the Lake Ontario squadron. In turn, Secretary Jones requested Commodore William Bainbridge to open a rendezvous in Boston to recruit men for the lakes. After two weeks, only one man had enlisted (and he promptly deserted). Knowing salt-water sailors were averse to serving on fresh, Bainbridge sent two drafts of men from Constitution to Lake Ontario. On May 7, 1813, Secretary Jones praised Bainbridge’s initiative: “The transfer of part of the Crew of the Frigate Constitution to the Service on the Lakes gives me great satisfaction as the nature of the Service required the most prompt and decisive measures to render it effectual.” These men had recently returned victorious from the engagement with HMS Java, and many of them were veterans of the Guerriere fight as well. Now that the frigate needed extensive repairs before her next cruise, Bainbridge could afford to dispatch them to the western theatre. Pittsfield. From Pittsfield they steered for Albany, NY, and then on to Amsterdam and Utica. The second detachment lost two men on the road. Sailing Master John Nichols died on May 10 at Lorraine, NY and Seaman John Harvey died on the 12th at Redfield, about fifteen miles south of Sackets Harbor. Part one of the crew’s journey. 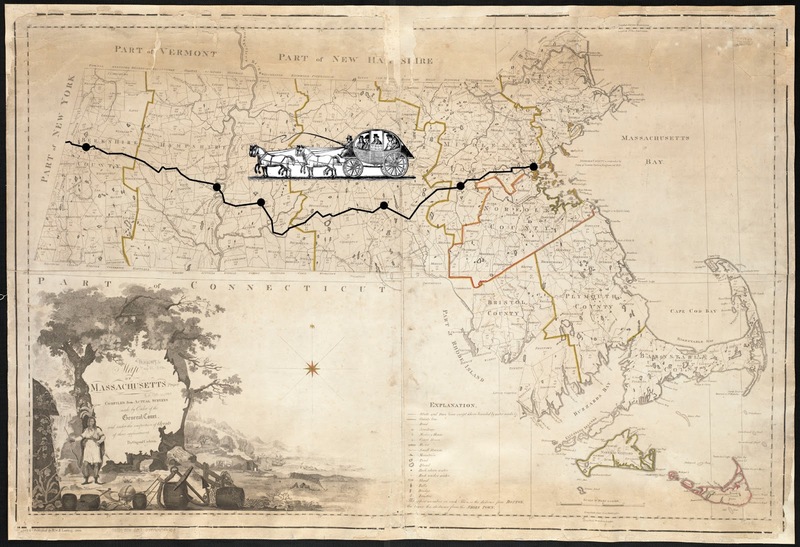 They travel by stagecoach across an 1802 map of Massachusetts by Osgood Carleton. Part two of the crew’s journey. By coach and wagon to Sackets Harbor, then by boat and foot to Lake Erie. The map is by Simeon DeWitt and dates to 1804. 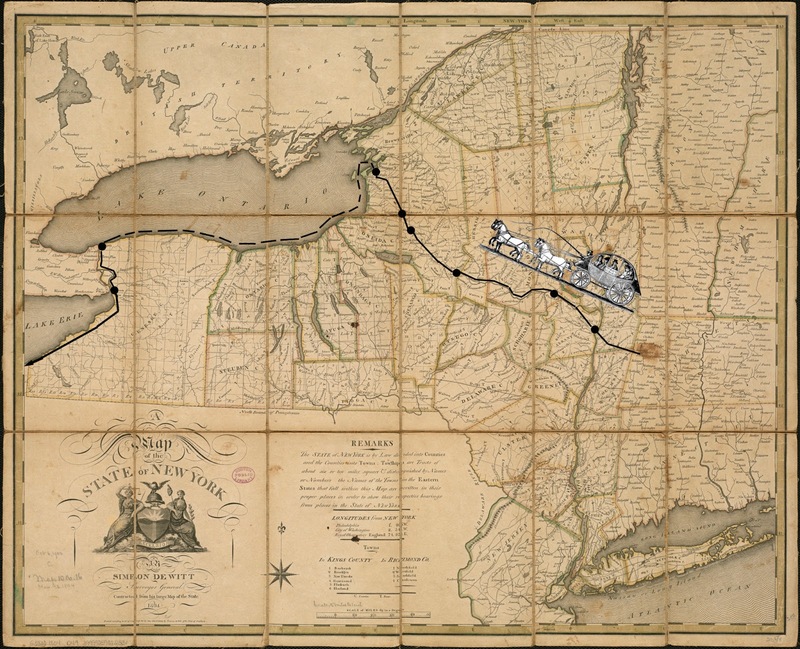 We don’t have anecdotes of the trek in the words of any of Constitution’s crew, but Seaman Ned Myers made a similar march from New York City to Lake Champlain. He described the adventures of the party. singing out “Stand from under,” hove one half of the roof into the street, and the other into the garden. We then gave three cheers at our success. The officers now came down, and gave us a lecture; but made out so good a case, that they let us run till morning, when every soul was back, and mustered in the wagons. In this way we went through the country, cracking our jokes, laughing, and noting all oddities that crossed our course. I believe we were ten or twelve days working our way through the state to Oswego. At Onondago Lake we got into boats, and did better than in the wagons. At a village on the lake shore the people were very bitter against us, and we had some difficulty. The word went among us they were Scotch, from the Canadas, but of this I know nothing. We heard in the morning, however, that most of our officers were in limbo, and we crossed and marched up a hill, intending to burn, sink, and destroy, if they were not liberated. Mischief was prevented by the appearance of Mr. Mix [sailing master commanding the detachment], with the other gentlemen, and we pushed off without coming to blows. The first detachment reported for duty at Lake Ontario on April 29. The second arrived around May 12. More research will be necessary to determine the final disposition of all the officers and men. Many were portioned out to the Lake Ontario squadron, and on July 10, 1813 Chauncey ordered Mid. Dulany Forrest to take 60 men from Sackets Harbor to join Oliver Hazard Perry’s squadron on Lake Erie. The schooner Pert landed the men at the mouth of the Niagara River. They marched to Black Rock with orders not to stop in Buffalo, but to “push on as fast as possible.” From Black Rock they followed the lakeshore to Presqu’ile. The men walked and wagons followed with their baggage. The draft reached Erie on July 23 or 28. There is still a much to be learned about this adventure. Because Constitution’s muster rolls for 1813 have gone missing, it is difficult to create a comprehensive list of the men who were drafted for the Lakes. Comparing the muster rolls of the Sackets Harbor and Lake Erie stations to Constitution’s December 1812 roll should allow us to discover which seaman and officers made the long overland trek. vol. 17, no. 2 (Fall 1988), 39-46. Commandants and Navy Agents, 1808-1865, M441, NARA. Newburyport Herald, 23 April 1813. RG 217, No. 208, NARA. Life Before the Mast (Philadelphia: Lea and Blanchard, 1843), 47-48. Numerical Series, RG 217, No. 3739, NARA. Albany Argus, 23 April 1813, and Baltimore Patriot, 26 April 1813.